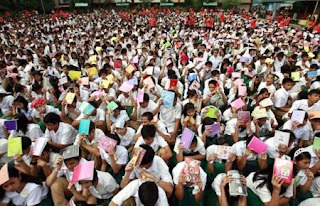 I happened to see this pic in webiste http://izismile.com/curiosities/ about 7,000 students practicing drill at a certain school in Caloocan City on a broad daylight. I remember in my high school days at San Jose Academy. We were trained by Assumption sisters what to do when in case of fire or calamity. As part of the practice, when we heard the alarm buzzed we don't have to panic, presence of mind and go out of the room in a single file. Yet when unexpected calamity struck, will this drill works when there is adrenaline rush running through the system?